Only five miles down the road from Heswall is WestKirby. So we popped on the A540. The drive itself is nice, occasionally catching views of the Dee Estuary. You can tell this is a well-to-do part of the world with the large, well maintained houses and serious looking gates. Parking in West Kirby was straightforward as we found a parking bay outside an antiques shop with two hours free parking. Although we had to be careful not to overstay our welcome as there were plenty of parking enforcement officers in force. West Kirby, whilst a well-to-do town like Heswall, is a bit more your new money sort of town. The shops are more on trend. There are plenty of beauty shops offering tans, nail art and a variety of lotions and potions that in another century would have been considered witchcraft. 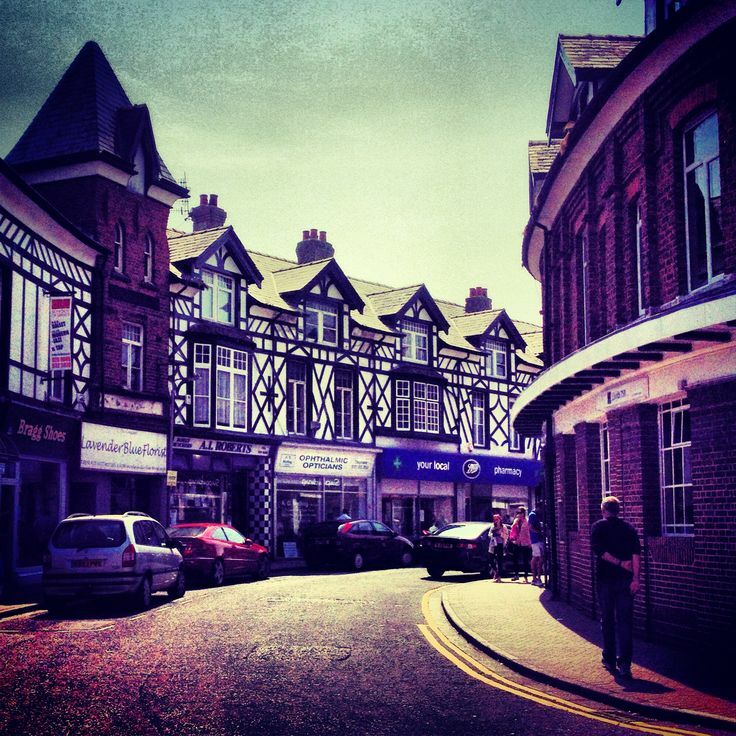 The buildings in the town are predominantly of Victorian origin – large, ornate and often with mock Tudor black and white panelled features. The Dee Hotel looked rather lovely with its faux Tudor features, despite the fact it was a Wetherspoons pub with drunken young lads smoking fags outside. Along some of the streets had wrought iron ornate canopies hanging above the shopMarina s. I always associate this with posh Victorian spa towns and seaside resorts. I guess the Victorians had the same inclement weather as we have now. 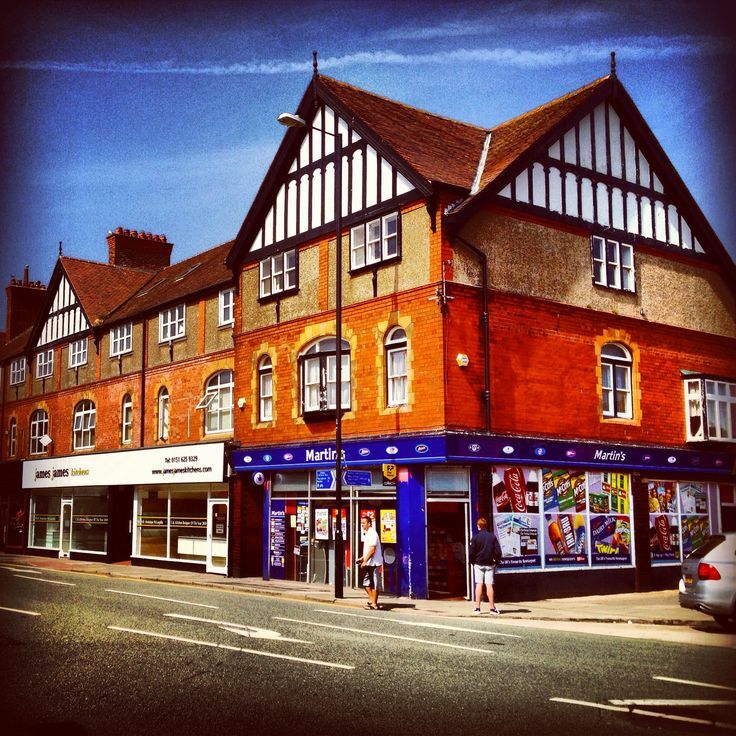 I noticed the shop keepers had retained lots of the original Victorian features and I can’t help but think this is why West Kirby looks so lovely. As it was a beautiful day West Kirby was busy. Unlike Heswall the beach and the Marine Lake is a big draw to the town. The train station in West Kirby is about 300 metres from the beach and a large influx of people had come in for the day from Birkenhead. I spotted some scally young men in sports gear heading towards the beach with beer and they were bearing their milk white chests, which were clearly untouched by sun or hard work. We walked along the promenade by the Marine where the posh boys were playing with their boats and marine toys, whilst the pensioners were watching on from the prom. The promenade is surprisingly under- commercialised. There seemed to be only one stall selling fish and chips. The purpose built toilets were packed with people getting changed for the beach. In addition there was a first aid point to look after those who had spent too much time in the sun. Morrisons supermarket was also doing great business from the day trippers who were buying food and drink for the beach. The beach itself was a wide expanse of sand. You could hardly make out where the sea was and there were plenty of families enjoying the sun shine. The promenade was full of pensioners and people with mobility issues who thought better of getting clogged up with sand. There were dog walkers too taking a constitutional with their pooches. One Bichon Frise really owed the strip. It was pulling its owner along saying hello to the all pensioners, sniffing other dogs’ bums and generally looking cool. This dog was channelling 1970s John Travolta and all it needed was the Bee Gee’s Saturday Night Fever soundtrack to complete the effect. The dog’s owner was just happy to be along for the ride, laughing at his dog’s antics. We managed to find the charity shops after doing a detour through the town and promenade. Whilst the young families from Birkenhead were on the beach soaking in the rare British sunshine, their Grandmas or, to use the Scouse term, their Nans were off rummaging through the nearby charity shops. The shops appeared to be well stocked. However for me the Heswall charity shops inched it in terms of quality. We definitely caught West Kirby on a good day. The sunshine definitely makes a huge difference to a place. I quite like the fact this place hasn’t been over-commercialised and remains a classy place to do the whole beach family thing.